We will have small group workshops during the day, and whole group activities in the mornings and evenings. Workshops will focus around teaching simple craft skills. Please note, Sunday (21st) will be at a different location. Friday day will focus on skills such as knitting, crochet, and felting so one can finish a small project easily in the weekend. 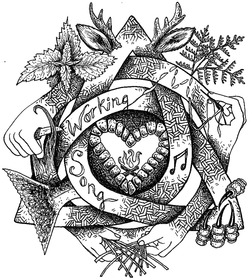 11:00 AM Optional: Join Unity Church service and offer songs from gathering as "Thank You"
We intend for this gathering in particular to seed other Working Song gatherings. In addition to doing physical projects, those attending can collaborate on technologies for community building -- land development, conflict resolution, sustainability resiliency, rituals and rites of passage, integrating kids, conscious and collaborative business models, mental health healing and integration, social justice, singing, sound healing, permaculture, soil building and carbon sequestration, community organizing, and other topics for bridging the current world we live within.